Building a webpage for an interactive model that users can comment on. 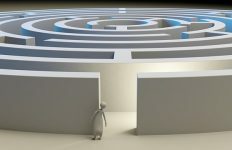 This is part 74 of a series of articles featuring the book Beyond Connecting the Dots, Modeling for Meaningful Results. A description of the challenge we are tackling, why we built the model, and what the model contains. 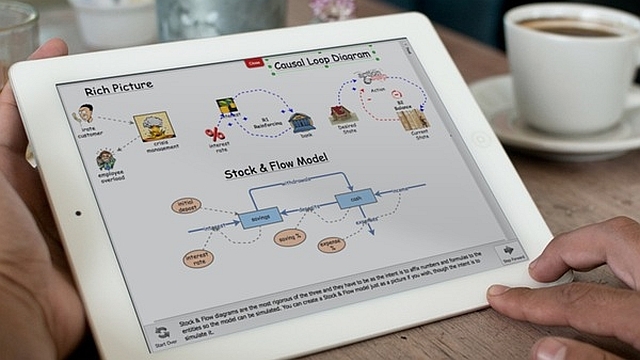 An interactive version of the model that the user can explore and use to run simulations. A discussion forum where users can post comments on the model and see what others have posted. This might seem ambitious, and it is! But using freely available technologies and services we will be able to put this webpage together very quickly. Let us split the webpage development process into three steps: first we’ll create the general page framework, then we will add the interactive model, and lastly we will add the discussion forum. Assume we decide to create a webpage exploring population growth and whether the Earth can sustain humanity into the future. We start building our webpage by creating an HTML file and putting the following text in it. 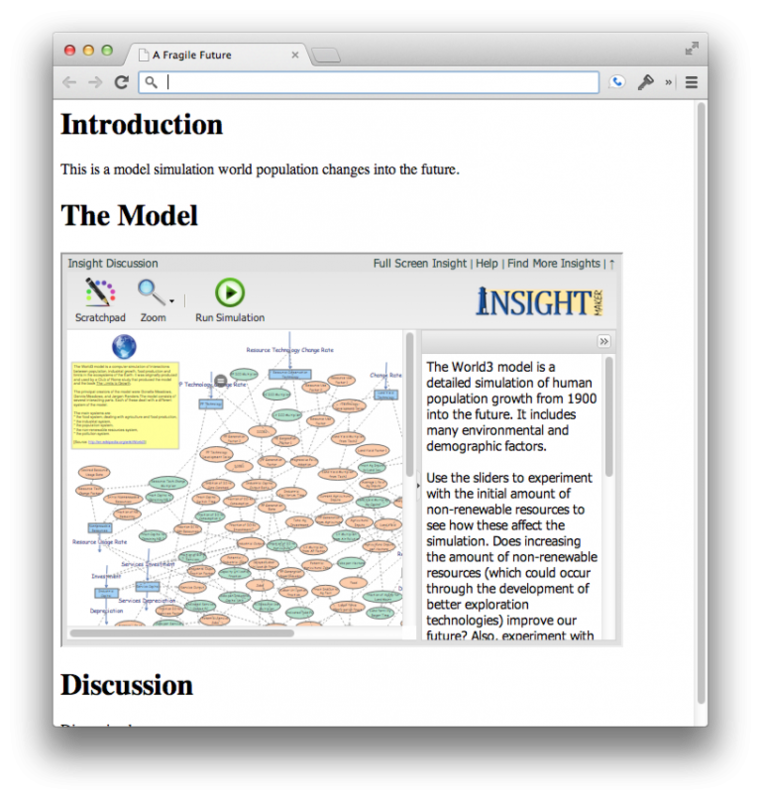 This creates a page with three sections: Introduction, The Model, and Discussion. We can fill in the Introduction section with text describing the problem we face and our approach to understanding it in our model. In this example page, we have just written a single sentence but you could extend it with more details on the model to fully explain to the viewer why this is important and how we have modeled it. The placeholders [Model goes here] and [Discussion forum goes here] are where we will insert our model and discussion forum later on. For now though, we just want to layout the structure of the page. Use this code to replace the [Model goes here] placeholder in your webpage. Save the webpage and open it in a browser. You now have a rich interactive version of your model embedded directly in your webpage! You can control several features of the embedding by editing the “<IFRAME>” tag. For instance the “width” and “height” attributes control the size of the embedded model. They are specified in pixels and you may change them to make the embedded model smaller or larger. The “topBar” and “sideBar” parts of the URL control whether the toolbar and the sidebar will be shown in the embedded model’s interface. By default, they are set to 1, which means these elements will be shown. Set them to 0 to hide the bars when the model is displayed. The “zoom” part determines whether the model diagram is shown at its full size or if it is zoomed to fit the window (the default). Set this to 0 to prevent the model diagram from automatically being resized to fit the window. Now we have one last piece to add before we have completed our webpage. We want people to be able to carry on a discussion about the model directly within the page. To make this possible, we need to add some sort of forum or discussion software. We could program our own custom discussion system, but, as with the model itself, it is easier to leverage existing free software than it is to develop our own. A number of free commenting and discussion systems are available. One of these is called Disqus. If you read a number of different news sites or blogs you have probably already used Disqus, as many sites use their software. First edit this code as instructed (e.g., replace any usernames or ids with the ones you have been provided by Disqus) and then replace the [Discussion forum goes here] placeholder in your page with this code. Load the page and test to see if it is working. One issue with Disqus is that it might not work if the webpage is being opened from a file on your computer. You may need to upload it to the domain name you entered when you signed up for Disqus to ensure it works correctly. Figure 1. Completed page with embedded model. Go through these same steps with a model of your choosing. Make your own custom interactive webpage. Next edition: Going Global: Flight Simulators and Serious Games.